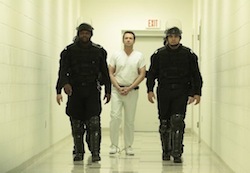 THE FOLLOWING may have had its share of villains over the first three seasons, but none has made quite the impact of Joe Carroll — both with viewers or on Ryan Hardy. But with a character that big, his time was, sadly, limited: in Monday night’s hour, “Evermore,” Joe’s execution actually happened. And though the show needed to embrace life post-Joe Carroll, there’s an element of bittersweetness to the end of this particular storyline. Though Joe was absent from much of the earlier part of the third season — as Ryan tried to keep his vow to not see him again — recent episodes have seen the two longtime associates share scenes (and appear in each other’s dreams). And Joe’s death will have an impact on Ryan moving forward. What did you think of Joe’s death on THE FOLLOWING? I think this was an extremely bad move. You can bring all the characters you want into this show, none of them will have the impact that Joe Carroll did. It was a very bad move and from what I have read on the social media, I am not the only one that feels that way. I understand that you can’t have 10 seasons of Ryan chasing after Joe but there was at least a couple more seasons left for that to be done. I for one will be done watching The Following after this season and the only reason I am finishing with this season is hopefully I will get to see Joe through Ryan’s thoughts. I seriously do not believe that The Following will make it to much longer without James Purefoy, the others are already boring me. Joe Carroll will always be with Ryan Hardy – Mentally! You are suppose to be professional writers I am sure you could of thought some more episodes for Joe to play! He was the best villain, and I couldn’t wait to see Joe. Come on you can bring him back, I could even write a story line bringing him back to the show. WE WANT JOE!!!!!!! yep. this show is DONE..this guy Theo is boring as hell…no interest at all. Totally agree, I love Kevin Bacon, he’s a fine actor, but James was the show in my opinion, I am afraid I will done after this season also. No Joe…no following. …i love Joe Carroll….he makes the show. …don’t kill Joe….I’m so disappointed! I agree with everyone else. Joe and Ryan were the reason I watched this show. Kevin Bacon is awesome but they are a twosome that shouldn’t be split up. I am also done watching the show. We watched the show for the layers that James brought to Joe Carroll…he was the unique fascination in a field littered with tons of throwaway characters like Ryan Hardy. In TV, always know exactly what and who keeps bringing them back (don’t look to see Norman Reedus’ Daryl Dixon or Andrew Lincoln’s Rick Grimes killed off any time soon on The Walking Dead). Sometimes when you are too close, you can’t see straight. This has happened here, and it’s going to cost them their show because now it’s just another cop show. Maybe they can limp into a season 4 renewal, but I think that would be an expensive gamble for FOX at this point (speaking as a former FOX Entertainment exec, by the way). I’m bored with Theo. NEVER bored when Joe was in the storyline. Bad move. Must find a way to bring him back…or the show is over. I am a huge Kevin Bacon/Ryan Hardy fan, but there is no other villain like Joe. He made this more than a catch me if you can FBI show. I couldn’t believe they killed Joe off the show. To me, he was the show!! I mean, come on, they could have thought of other scenes with Joe & Hardy. I think they made a big mistake. I’m not even interested in watching it anymore. TEAM JOE!! What a disappointment! The show should of moved into the direction of Joe and Ryan becoming allies somehow if you couldn’t keep Ryan chasing Joe for 10 seasons! There was so much more you could have done with Joe and Ryan. Sorry, they are the main characters and your viewers have a connection with both of them. I love Kevin Bacon but the name of the show should no longer be ‘the following’….without Joe! Probably won’t watch after this season! No Joe Carrol, no following! If he isn’t brought back some way then I will NOT Watch this amazing TV show again! You will lose viewing and the show will be axed and then, what a bad decision you made by killing off the MAIN character of the ‘the following’! Agree with most above. I’m not one to give up on a show, especially one I rank as one of my favorites, but now I’m not so sure. I really grew to love Joe and was becoming bored until he was finally featured this season. Half the fun as a viewer was realizing you were rooting for such a twisted character – that was really starting to become a bigger deal. I’m holding out hope for one of the orderlies in Joe’s final scene – he seemed to disappear rather mysteriously. Was it a serum that only faked his death?? Devoted Followers can dream! How is the show going to go on without Joe? It’s title “The Following” says it all – it’s the following of Joe Carroll!